Picture of Notill Soybeans into Corn Stalks in the Hills of Northumberland Cty. Thank you to Adam Bent (Nufarm) for sponsoring breakfast. As experienced almost everywhere, rainfall amounts the last two weeks have varied widely. Planting is ongoing but area-specific. In general, the group thought the ground was even a bit on the dry side at the current time. “Even normally swampy areas of fields are planting”! Little rainfalls are interrupting the planting progress for a couple of days every 3-5 days. Everyone is anticipating a good 8-10 days to finish. However, the west end of the region on the heavier soils is behind and it will take a few days for these fields to be “fit”! Its amazing how much has got done in the last two weeks. The logistics are such that the amount of crop needed to be planted can’t be done in one week, but it can be done in two weeks. Retail and equipment sectors have been hard pressed to keep up. One thing that has changed in the last few years is that farmers are equipped with almost the same size trucks as the dealer network so what comes in is going out just as quickly. In future trucks and labour will be a continuing problem in meeting farmers’ needs of timely supply of inputs. The retailers indicate that they are well over the hump on fertilizer and have lots of spraying ahead of themselves. Lots of planting has been done but varies by area. Some areas with fewer acres planted received rain at the wrong time. More questions are coming in from producers on managing fleabane, so the message is to be on the lookout for a glyphosate resistance problem. Weather information locally will be available via Pioneer who is installing linked real time weather stations at dealer locations. This will be 110 stations throughout Ontario. Anyone can access by downloading app for iPhone and Android called “Weatherlink2.0”. You have to create an account, log into the system to see the range of stations available, and then “follow” the ones that are of interest to you. The data includes temperature and rainfall. People with their own stations have to ensure that they are properly located to ensure accuracy. Installing a station beside a tree or building impacts true readings on temperature and rainfall. Some discussion about the “shame that it is” that there are lots of weather stations around the province but they are not real time or linked so that data is easily shared. More needs to be done to bring these resources together for the betterment of all. The cool spring to date has delayed grass growth. In many cases livestock has been turned out too early for the conditions and this might negatively affect summer and fall production. However, it was acknowledged some farmers were under pressure to get livestock on pasture as they were running out of high enough quality feed from last season. There is a whole lot more we can do to manage pastures better in the region and across the province. Those that have held off turning out their stock will likely benefit from that decision. In general forages are okay but some fields did not overwinter well and should be taken out. These fields could be rotated into soybeans after first cut, or an annual forage if the feed is needed. Weak stands are resulting from a combination of the weather over the past couple of years and management. However, the slow growth we have been talking about all spring really sprang forward this last two weeks. No one reported hay cut in the area, but further west a few fields were down. First cut is expected to start in earnest by beginning of next week. There are not a lot of buds showing on the alfalfa yet, so we are not losing quality and the heat is bringing on growth. Lots of spraying has happened with pre-emergence programs on planted corn and soybean fields. Some spray has been on for several days and has only received 2/10”s of rain since application. The group expressed concern over whether there has been enough rainfall for activation. A question was asked about how much rain is needed and by when after application to kick start activation of pre-emergence herbicides. 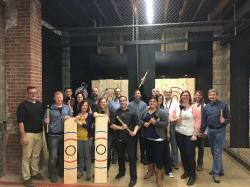 While it varies by product, the group thought a good ½” to -3/4” within 7 -10 days is important to optimizing effectiveness. Some thought that worked ground wouldn’t have enough moisture for activation yet but that no-till fields likely do. The later you go the problem is both lack of control of the weeds currently emerging and whether the products can reach back or even activate to control the weeds that are yet to emerge. Where the rainfall is not received within the window indicated above, there fields will have to be monitored to determine if other action is required. Planting completion ranges from 50-90. Those that are behind on planting are starting to ask about switching hybrids and even from corn over to beans. For the most part the word is there is lots of season left and if you can get it in these next few days, keep going. With the lighter textured soils the crop seems to have gone in with good conditions. Heavier soils are experiencing a bit of compaction and this will have to be monitored throughout the season. The group was mostly pleased with the emergence time and uniformity. Corn planted May 2nd is already in the 3 leaf stage. Things are progressing but as the corn finishes; the farmers are not as anxious about the beans and waiting to ensure fields are “fit”! Worked ground is well underway but no-tillers are a bit behind as the temperatures have not brought the fields along to being “plant ready”! The amount seeded varies widely from as low as 20% to over 75%, mostly due to soil type and amount of rain received. Size of farm impacts this too which changes by area. 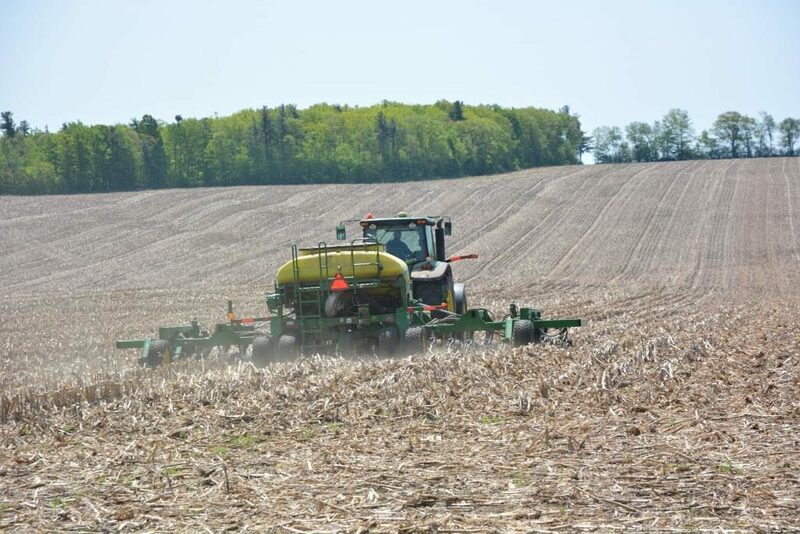 There was discussion that the delayed soybean planting is likely to impact wheat planting date this fall, but there is not anything that can be done about that. It was surprising though how many people are equipped to plant both corn and soybeans at the same time. 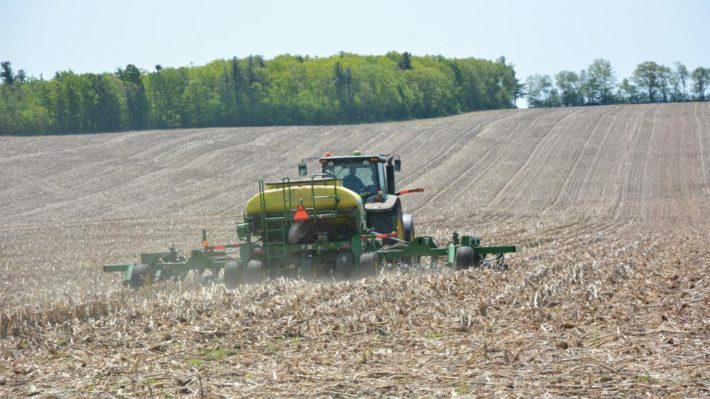 If wheat planting date is an important target, choosing to plant soybeans at or ahead of corn might pay off, however the difference can’t be too much or the current crop’s yield potential can be impacted. The biggest challenge with soybeans continues to be fertility. Lots of fields are just too low in P and K and it’s impacting yield. More has to be done to have people recognize the impact of this management oversight. Growers have to look at their micronutrients too. There has not been enough soil testing going on to point out these deficiencies to people. There was some discussion on population targets for soybeans. Local tests have shown not a lot of yield response despite the population differences. The group agrees there is room to improve but that in general there are enough field-to-field differences that populations have to be managed on an individual field basis and adjusted for conditions, variety selection, and planting dates. Farmers have been getting better response with planters than drills in terms of stand and uniformity. Lots of scouting and spraying has been happening with finishing up N applications and working on spring weed control. There is still some wheat to be sprayed first time, but that acreage is dwindling. The later planted wheat is still lagging behind. Even with N application, it just hasn’t bounced forward and in fact some fields are retreating. Agricorp received a number of damage reports on a portion of these late fields in the last two weeks. While it is quite a few calls, it still represents a very low percentage of the total wheat acreage. A number of these fields have been released for replanting. Wheat growth stage varies widely but it’s mostly in the 2-3 node stage. The majority of crop will be at flag leaf in the next week to 10 days. Growers should continue to scout their fields for disease as this is the critical time for protecting yield with a T2 fungicide if necessary. Not much of T1 fungicide was applied as disease pressure has been low so far. No stripe rust has been reported in Ontario to date. The crop that was planted early is progressing well. While a number of acres have received a herbicide application, at this point for most fields it is too late as we approach flag leaf. Better to drop the herbicide and concentrate on timing the T2 and T3 fungicide applications optimally if needed. Weeds not controlled at this stage have already done their damage to yield and the investment in time and product at this point is not economical and can result in injury. Where weeds are a real problem that haven’t been addressed yet, plan for a pre-harvest herbicide treatment to aid harvest and prepare for the next crop. In general it was thought that spring herbicide applications were down so wondering if it was because of fall programs or farmers just avoiding because of the season and state of the wheat crop. Still recognize that fall herbicide programs are on a small percentage of the acreage. There was a great deal of discussion around weed control programs in winter wheat. The group strongly believes that we should be trying to move producers to fall herbicide programs. The results this spring have really shown the value of that timing. Timing is often hampered in the spring and those overwintering weeds get big and beyond effective control maturity quickly reducing the investment in spring herbicide programs. Spring weed control timing is impacted by cool overwintering temperatures which offer concern over crop injury, wet field conditions can impact optimal herbicide timing, and weed growth of those overwintering species becomes very rapid. Best to control them in the fall and scout in the spring with the hope of a good crop canopy greatly reducing the need to spray spring herbicide. Prime examples of the success of fall herbicides have been dandelion and fleabane as well as other winter annuals. Some though were concerned about avoiding spring applications. Wrecks can happen and these can impact harvest and next crops. It comes down to knowing the fields and scouting in spring to ensure fall treatments are doing the job. This is especially true for late planted fields that don’t have the growth coming out of winter or the vigor when spring weather kicks in. There is also the issue of fall herbicide programs vs red clover seeding impacts. There is a lot to weigh in these decisions. Mike Cowbrough has been asked to respond to the issues around weed control in wheat and we will report his comments when received. Early spring diseases have been low with minimal fungicide applications occurring to date. Where applications have been made is on more susceptible varieties and where there is really lush growth. If disease pressure is low pass on the T2 and concentrate on optimal timing for the T3 FHB application. Still 2-3 weeks away from FHB sprays but it is field to field dependent so keep scouting those acres. Cereal leaf beetle adults have been found in the Alliston area. Best to scout fields where this pest has a history of showing up first, particularly mostly on sandy soils ground though infestations are widespread this year so don’t assume only fields with a history are at risk. Scouting is advised for the next two weeks or so. A good amount of cereal rye was out last fall. Most will be cutting shortly as the head is near the top and they will be using this for feed. It is not as heavy a crop as last year but still decent, and then it will go to beans. Mostly people are planting into the cut rye and then spraying out the regrowth when it greens up in the emerged beans. There was significant discussion about how to manage cover crops. Lots of people want them dead going into winter while others thought the dead foliage fell over and matted, making it harder to get sunlight to the soil early in the spring. It’s obvious that there is still lots to learn about cover crops and that there will be individual field conditions that will dictate when and how to use them. One of our farmers felt his green planting was keeping his planter cleaner and thus able to plant better and earlier (soil moisture wise) than his conventional neighbours. One of the biggest factors is managing the seeding rate that people are using for cover crops. The target is to cover the ground with living plants whether that is just the fall or through the winter. Less is better from a seeding rate perspective – forage seeding rates are too high unless the cover crop is being harvested as feed. Canadian Agricultural Partnership – The first intake window closed May 8. The next intake will be August 7-28. Funding is available for eligible projects involving continuous rinse systems for sprayers, cover crops, and plant health initiatives. Species at Risk Farm Incentive Program (SARFIP) – Applications are being accepted until December 14. Eligible projects include setting up rotational grazing systems, fencing to exclude livestock from surface water, windbreaks, and habitat creation. The Soil and Crop Improvement Association is administering both the above programs. For more information in Quinte and East Central regions, contact Paul Reeds (705-341-4915 ). OSCIA Forage Masters Competition closes July 15 and they want to increase registration, so looking for help to promote the program.